Zinc's Hands Free mode (formerly known as Voice Assist) reads out loud any text that a user receives and plays back all voice messages. The audio can be played back either through the device speaker, headphones, or a connected bluetooth device. 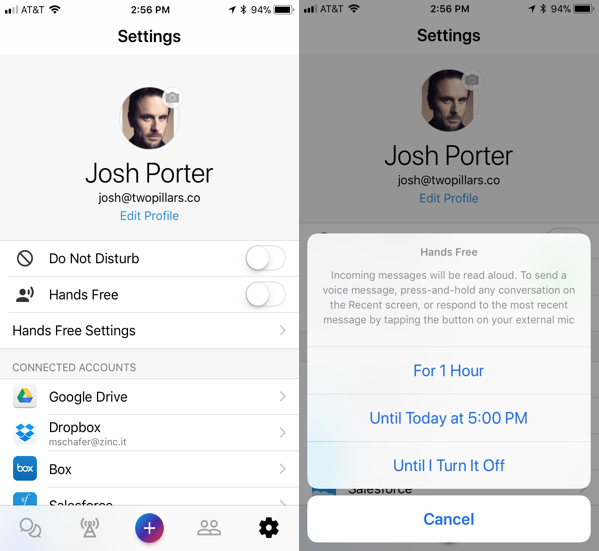 New messages can be sent via voice simply with the press of a button. Turn on the Hands Free within the settings tab of your mobile application, underneath your personal tab. Click the slider button and choose how long you want to enable voice assist for. Once Hands Free is set to on, all incoming messages will be read out loud. Recorded voice messages will be played out loud. The red microphone icon indicates which conversation is your default conversion. Generally the latest message that came in is your default conversion, any messages you send will automatically be sent to this conversation. 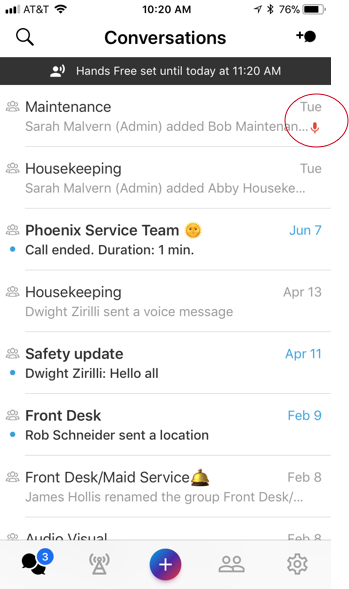 To choose which conversation you want to send a message to simply by pressing down and holding any conversations on the recents screen. In a scenario where a user has been offline from Zinc for a while and messages have accumulated, users can catch-up on messages using Hands Free mode. 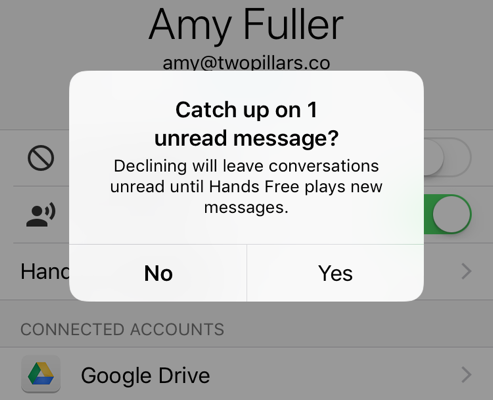 By turning on Hands Free and choosing to "Catch-up", all unread messages will be read to the user. Based on user feedback, we changed the name of this feature from Voice Assist to Hands Free to better describe what the feature does. We'll be updating the above video shortly. The feature works the same, it's just called something different.